While there has been no shortage of Match 3 games over the last couple of decades, my first experience with the genre was Columns for the Sega Genesis. There were other puzzle games that were around at the time, but Columns took the various formulas that myself, father, and family were used to however, and turned it on its head. Thanks to Tetris, I had grown used to the idea of making objects disappear by lining up falling pieces to fill the entire horizontal space of a board, but the switch to a game that required players to match colours and not just fill space was a new twist that had my dad, uncle and myself hooked when we first played it. Similar to Tetris, your pieces fell from above, but instead of dealing with a variety of different shapes we had columns of three that came in different colours. Instead of flipping the pieces around, you were shifting what order the colours came in. Lining up three of the same colour caused those pieces to dissolve and all of the pieces (if any) directly above then plummeted down as far as they could. The vertical and horizontal matching came easily - but it was the need to also consider horizontal match ups that really kept me puzzling. The graphics were simple, but these were relatively simple times. The gems had a nice reflective/crystalline quality to them and the music... well, frankly I absolutely loved the music. It was calm the majority of the time and had a strange, almost haunting quality to it that I actually never really grew tired of despite the relatively sparse number of tracks to the game. One track in particular - Clotho - has proven to be the most popular over the years as there are no shortage of YouTube videos that play this particular tune. While Columns was not the first match 3 game ever, it was, arguably, the one that really got game developers figuring out how to make the simple gameplay loop of matching three or more objects together into compelling experiences. As a result, there have been what seems like a zillion different takes on the genre over the years, from Bejewelled to Candy Crush and on to hybrid games like Puzzle & Dragons and Puzzle Quest), and I find myself gravitating to the genre time and again. It's also a genre that just about everyone can enjoy. I actually introduced my dad to Bejewelled a few years ago. He has a very analytical mind, but is not really one for games that require fast reflexes, so the slower, more thoughtful pace of Bejeweled has given him his primary reason for firing up the PlayStation 3 over the last few years. 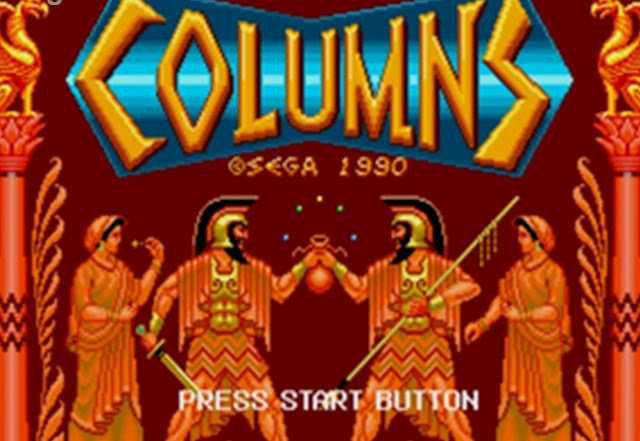 I consider Columns the classic match 3 game given that it came out so early in the Genesis life cycle. It has spawned some direct sequels over the years as well. The genre has found itself heavily leveraged by mobile and touch devices, which makes a lot of sense given the relatively low system requirements and that the touch and drag gameplay works well for the more turn-based Match 3 games out there. Some of these titles work better (The Dungeon Saga for example versus Crazy Cheebo: Puzzle Party) than others. 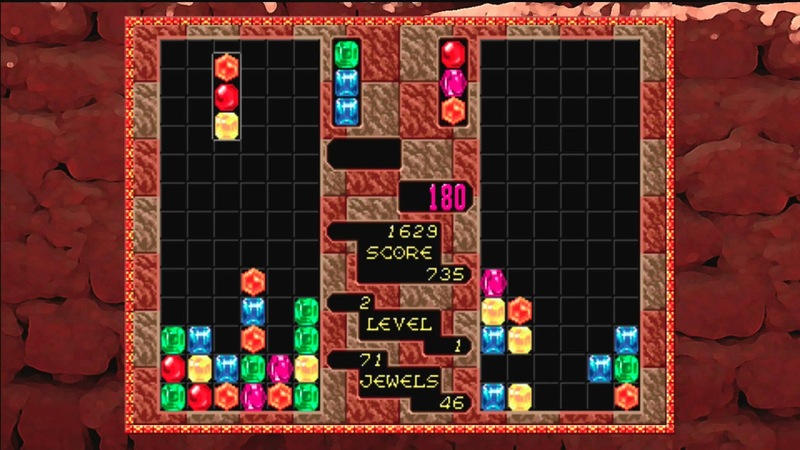 While games like Puzzle Fighter clung to the matching colour idea, and Bejeweled came up with different modes of play and power-ups, perhaps the most surprising evolution of the genre has come in the Puzzle Quest series. Now I first experienced Puzzle Quest on the Sony PSP, and I was immediately hooked. I have always been a big fan of progression in games, the ability to accumulate 'more' - experience, items, gold, whatever. The idea that you could merge a puzzle game with a match 3 component with an RPG was awesome - and everyone in my family got hooked on it too. This was especially impressive considering my wife is not what I would consider a gamer, but she played it through to completion. Over the years the Puzzle Quest formula has been tweaked in a variety of ways. Matt reviewed its melding with Magic: The Gathering quite favourably. While I also have that app on my phone, the version I play the most is the Marvel version of Puzzle Quest. There are all of these heroes and villains to unlock, and you can level them up, and you can increase their powers so they can deal damage to their opponents and... this doesn't sound anything like Columns, does it? But then you think back to how at its heart Columns was simply about matching three colours and you realise that a genre can and should evolve over the years. Admittedly Columns was a rather limited game. There was no endgame - you simply tried to score better than you had the last time you played, or perhaps attempted (and often succeeded, I like to think) in besting the scores your father or uncle were capable of coming up with. When I think back to the Sega Genesis console, there are a number of games that come to mind - especially strategy and RPG titles. However, Columns is right up there. In part because it was one of the titles gifted to me by my uncle when he gave me his Genesis a few months after buying it as a birthday gift, but because it was something different that I was able to play with others who did not normally game with me. 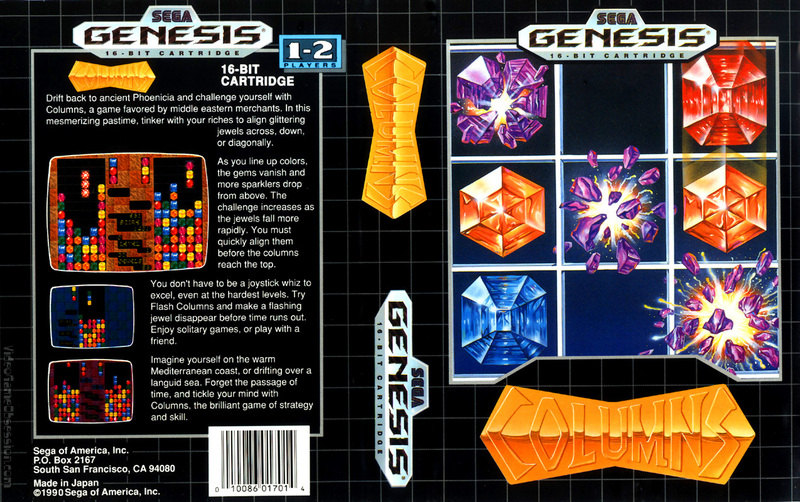 I know Tetris is viewed by many as the ultimate in these types of titles, but I always held Columns in higher regard. My hope is that developers will continue to look back and find ways to inspire new directions in gaming. In an era where it seems like there are 'HD remasters' of almost every semi-popular game out there (and plenty that probably didn't need a remaster of any kind because they weren't all that popular in the first place), I hope that we can get games that dig deeper and further back than just putting a gloss of new paint on familiar mechanics. Item Reviewed: On the evolution of the mighty Match 3 since Columns 9 out of 10 based on 10 ratings. 9 user reviews.